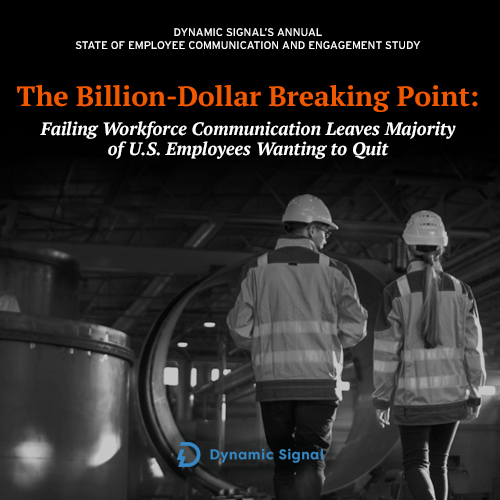 The Voice of America’s Dora Mekouar recently reported on Dynamic Signal’s 2019 State of Employee Engagement and Communication Study. Here is Mekouar’s article, which features an interview with CEO Russ Fradin. Among the most frustrated workers are the 80 million hourly employees who rarely have access to a work email. These non-desk workers include people employed in retail stores, hotels, restaurants, bars, production facilities, warehouses, and hospitals, as well as delivery drivers. In addition, the survey finds that workers spend up to two hours of each work week looking for information they need to perform their daily tasks. Using posters in the break room or on the factory floor, or newsletters and magazines, to communicate with employees might have been effective before the advent of smartphones. But now that the vast majority of Americans – 77 percent – own a smartphone, companies like Fradin’s, as well as the Harvard Business Review, are making the case for using mobile apps to improve employee communications. This article first appeared in Voice of America.